The present invention relates to organic compounds, their use as hole transport materials. And their use to tune HOMO levels, for Photovoltaic, Optoelectronic and electrochemical devices, such as lasing, light emitting devices, photodetection in particular solar cells and solid state cells including tandem cell applications comprising these compounds. The conversion of solar energy to electrical current using thin film third generation photovoltaics (PV) is being widely explored for the last two decades. Perovskite solar cell technology is a revolutionary third generation photovoltaic system that is taking the renewable energy world on a dizzying ride of new prospects. One of the problems with the typical perovskite solar cell configurations used is their reliance on an expensive and difficult to manufacture organic hole transport material called "Spiro-MeOTAD" (for short). Additionally, this material is currently under patent protection from Merck, and as such has restricted supply options to facilitate rapid expansion in the marketplace. Spiro-based organic semiconductors have attracted considerable attention, more precisely, 2,2',7,7'-tetrakis-(N,N'-di-4-methoxyphenylamine)-9,9'-spirobifluorene (spiro-OMeTAD) is selected as the benchmark HTM for PSC. However, the tedious multi-step synthesis of Spiro-OMeTAD makes it prohibitively expensive and cost-ineffective. Moreover, high-purity sublimation-grade spiro-OMeTAD is required to obtain high-performance devices. Therefore, a huge interest in the development of novel small-molecule organic semiconductors has been raised to find a better understanding between HTM structure and PSC performance. So far, although a large number and different types of HTMs were reported reaching an efficiency of 16-17%, only very few candidates showed PCE values over 19%, mainly because of the additional interaction improving the hole transfer at the HTM/perovskite interface. 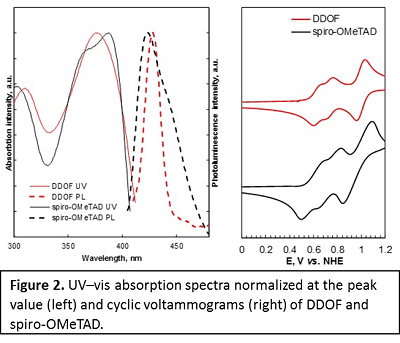 In this work, we presenting the development of an alternative spiro-annulated HTM materials (derivatives of previously associated provisional patent application-2016-045), synthesized using easy 3-step preparation procedure and characterized using various optical, thermal and electrochemical measurements (Figure 1-4). Dimethoxydiphenylamine-substituted dispiro-oxepine derivative 2,2',7,7' - tetrakis - (N,N'-di-4-methoxyphenylamine) dispiro - [fluorene-9,4'-dithieno[3,2-c:2',3'-e] oxepine-6',9'' - fluorene] (DDOF) has been designed and synthesised using facile synthetic route (Figure 1). The new hole transporting material (HTM) was fully characterized and tested in perovskite solar cells exhibiting a remarkable power conversion efficiency of 19.4% (Figure2-4). 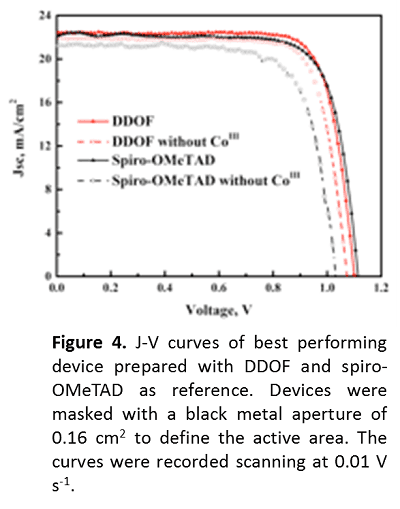 More importantly, comparing with Spiro-OMeTAD-based devices, DDOF shows signiﬁcantly improved stability (Figure 3). The comparatively comprehensive solid structure study is attempted to disclose the common feature of good performing HTMs. 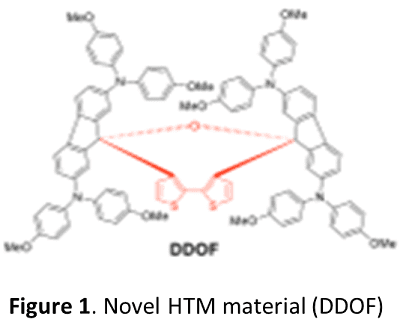 These achievements clearly demonstrated that the highly hindered DDOF could be effective HTM for the fabrication of efficient perovskite solar cells and further enlightened the rule of new HTM's design. To summarize, we offer a novel dispiro-oxepine derivative as a hole transporting material, obtained by facile 3-step synthetic route. 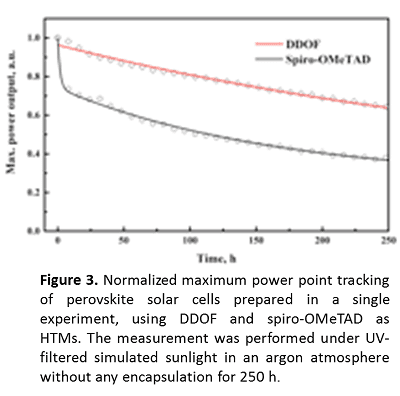 Perovskite solar cells employed DDOF as HTM showed one of the highest power conversion efficiency of 19.4% reported to date. The solid structure study by single crystallography indicated again that the - interaction is not prerequisite for designing effective HTM. Moreover, improved long-term stability over 850 h has been demonstrated, making this HTM as a very promising candidate for industrial production. The present invention is for Photovoltaic, Optoelectronic and electrochemical devices, such as lasing, light emitting devices, photodetection in particular solar cells and solid state cells including tandem cell applications comprising these compounds. Patents covering the proprietary support materials have been filed in the USA. The new materials have been well characterized and are ready for scale-up production. The current capability is in batch production of several grams, and it is expected to increase the production by 5 to 10 times in the next stage. ⇒ Solar cell manufacturer and investigators. Dr Muhammad Sohail, Scientist at Qatar Environment & Energy Research Institute (QEERI) Hamad Bin Khalifa University (HBKU).